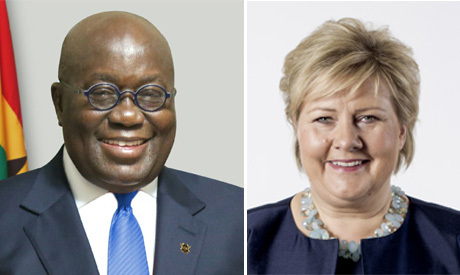 What unites the Prime Minister of Norway and the President of Ghana? While we come from different countries, with different cultures, languages, food, and weather, we are co-chairs of the UN Secretary-General’s Sustainable Development Goals (SDGs) Advocates group. We are both dedicated to the SDGs, and believe in their promise for our peoples and our world. Although we live in challenging times, we are motivated by knowing that we have an ambitious and comprehensive plan to meet these challenges. The SDGs - 17 universal development goals, agreed to by 193 countries in 2015 - are the blueprint for a world without poverty; for increased equality, security and prosperity for all; and for a healthy and thriving planet. This weekend, we will be together in Johannesburg, in the beautiful Republic of South Africa, with people from around the world, of all ages and backgrounds, to reflect on the important and inspirational legacy of Nelson Mandela, Madiba, commemorating the 100th anniversary of his birth. Today, we can see his legacy in the SDGs – they provide a continuation of his lifelong work to eradicate poverty, inequality and injustice. As he said: “As long as poverty, injustice, and gross inequality persist in our world, none of us can truly rest.” We gather in Johannesburg to celebrate Nelson Mandela’s amazing life and commit not to rest until we succeed in realising the SDGs. The SDGs apply equally to every country in the world – rich and poor alike. They offer everyone - politicians, activists, students, business leaders, workers, farmers, fisherfolk, citizens of every nation - an opportunity to play a part in building the world we want. Together, through strong partnerships, we can accelerate the change our world needs, as world leaders promised to do in 2015 when they signed on to the SDGs. Impressive progress has already been made. Over the past three years we have seen huge leaps to lay the groundwork for achieving the SDGs. There has been significant global action to fight AIDS, tuberculosis, and malaria, and historic multilateral agreements signed on everything from oceans to family planning. Moreover, action on the SDGs is being taken by people all over the world, from civil society organizations to the private sector, who are seizing the opportunity the Goals present. Sustainable business alone could unlock $12 trillion in economic opportunity, according to the Business and Sustainable Development Commission. Businesses, large and small, are aligning their strategies with the SDGs, for their benefit and the benefit of our world. A new class of SDG-aligned customers has emerged. In the last two decades, 1 billion people have been lifted out of poverty, child mortality has halved, and HIV infections have fallen by 40%. Despite this progress, we are not moving fast enough. Many more of our most vulnerable people need to be reached; we must keep up our momentum and ambition. Citizens across Africa, especially young people, are leading the way in the path to a sustainable future, driving inspirational and energetic change and progress in their communities. The SDGs demand that we invest in the health and education of this next generation of change-makers, to ensure they can pursue fulfilling career paths and become innovators, leaders, and global citizens. It is our collective responsibility to ensure that their voices are heard and represented in the SDG agenda. Next year, for the first time at the United Nations General Assembly, Heads of State will report on their country’s progress towards meeting the SDGs. This will happen once every four years, and will be a moment to reflect on what has been achieved, and determine where we are falling short. We will be there to show our commitment to the SDGs and the people we represent. We encourage our fellow leaders to join us. Each of us must ask ourselves, “What can I do to tackle the challenges we face today?” We must continue to push forward, remain ambitious, and make smart decisions that empower change. If we do that, in 2030 will we stand as the generation that ended extreme poverty, tackled climate change, and successfully fought injustice and inequality. We should dare to be audacious. As the co-chairs of UN Secretary General’s SDGs Advocates group, we recognize that we can achieve more when we act together. We will endeavour to build partnerships that accelerate progress towards the SDGs, and we call on everyone to help. Every single day counts, every single individual adds up, and we must ensure, together, that no goal, and no-one, is left behind.